Arcade game in which our task is to eliminate ominous green pigs and demolish the structures on which they spend their time. Angry Birds VR: Isle of Pigs is the first attempt to transfer a popular brand to virtual reality. Angry Birds VR: Isle of Pigs is the first production under the Angry Birds brand, designed with virtual reality sets in mind. This arcade was developed by Resolution Games studio, in cooperation with the authors of the original - Rovio Entertainment. In Angry Birds VR: Isle of Pigs, the feature layer does not play a particularly important role. The game takes us to the title island, where sinister, green pigs go on holiday. Our task is to collect stolen eggs. In Angry Birds VR: Isle of Pigs the action was shown from the first person perspective (FPP). Using the slings, we shoot furious birds as we try to eliminate their greedy enemies. This is complicated not only by the fact that individual targets often hide behind elements of fancy structures, which we first have to demolish, but also by the fact that we have a limited number of moves to defeat enemies. The game takes place on several dozen levels of exotic beaches, steep cliffs or snowy peaks. The key to success is not only the selection of the right position and the angle at which we release the bird, but also the skillful use of the special abilities of our wards; for example, Chuck flies at a dizzying speed, while Bomb explodes, destroying everything that is nearby. The effectiveness of our actions is reflected in the number of points and stars gained after completing each stage. 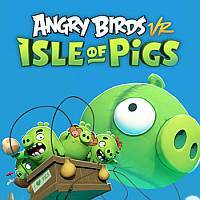 Angry Birds VR: Isle of Pigs has eye-catching three-dimensional graphics in a colourful cartoon design. The game requires not only virtual reality goggles, but also dedicated motion controllers.